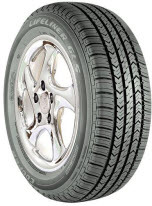 Cooper Lifeliner GLS tires combine an all-season touring design with a smooth and very comfortable ride. Built right here in America, this Cooper tire model offers solid performance in all types of weather conditions. The tire itself is available in T, H or V speed rated models, and features a computer enhanced tread design to maximize handling and treadwear. A notched center rib, refined tread elements and unique shoulder slotting give this model its longer treadlife, as well as better performance. The five rib tread pattern with computer enhanced pitch sequence helps eliminate road noise and keep things quiet inside the vehicle. Overall, Cooper has designed a quality all-season touring tire provides impressive ride comfort and more than adequate performance on both wet or dry roads. It’s American made and has a long lasting treadlife. Prices on the Cooper Lifeliner GLS range from around $50 for the smaller 13 inch series to approximately $120 for the 17 inch series tires. Who Are Cooper Lifeliner GLS Tires Designed For? Cooper has developed the Lifeliner GLS for drivers of all types of coupes, sedans and minivans who are looking for an all-season touring tire that handles well in all weather conditions and provides a smooth and comfortable ride. Cooper Tires provides for a 65,000 mile treadlife warranty on the Lifeliner GLS that are T speed rated. H and V speed rated tires are covered for 50,000 miles. There is also a first 2/32 inch of treadwear guarantee on the tire’s uniformity. Materials and workmanship are backed for life and include a free replacement tire during the first 25% of wear. That is followed up with a prorated amount down to the last 2/32 inch of useable tread left on the tire. You’ll also get Cooper’s 45 day road test drive. If you are not satisfied you can exchange the tires for another Cooper model.